He usually wore a brown western hat and, in earlier years, a bolo tie with a turquoise slide. Bud Soltau’s friends and family say he was quiet but direct, warm and funny, generous and honest. When his wife Lorraine started a pioneering swim school in Walnut Creek, and later a world-class Arabian horse ranch in Alamo, Soltau supported those ventures full-tilt. If Lorraine was the face and drive behind them, Bud was the nut-and-bolts support just slightly in the background. Roxi Sater said Bud and Lorraine were the right kind of company to keep. “There is family by blood, and there is family by choice, and the Soltaus are the kind of family you choose,” said Sater, an Oakland resident who met Bud Soltau at an Arabian horse show in Reno in the late 1970s. A native of Minnesota, he served as an Army Air Corps lieutenant during World War II, working as a pilot and flight instructor. He came to Walnut Creek in 1949, and worked many years with the Berkeley Bank for Cooperatives, and later with the Acalanes High School District in building and maintenance. Those were his “day” jobs, but he spent much of his off time as a partner in the swim and horse ventures. He taught swim classes at night for some years. From 1952 until 1973, Soltau and his wife operated the Soltau Swim School in Walnut Creek. They taught the children of many prominent Central County families to swim, and Lorraine organized the synchronized swim team, the Soltettes. The swim school also operated in Palm Springs, Roush said, and the Soltaus rubbed elbows with many famous people there. “I asked my son, who was 3 when he started taking swim classes in 1961, what his clearest memory of that time is, and he said, ‘The Messerschmidt,'” Roush said. That was a small three-wheeled German car, decorated like a fish complete with tail fins, that appeared in the Walnut Festival Parade and at other functions around town, a sort of rolling billboard with Bud at the wheel. Since the swim school closed, Bud and Lorraine have operated Soltau Kings Crest Arabians, International, a horse ranch based on their Alamo land. Bud had also served as president of the Diablo Arabian Horse Association. Diane Houle got to know the Soltaus through horse breeding, but learned first-hand of Bud’s generosity on a more personal level. The divorced mother of two came to Danville in 1970, and could only afford a tiny house. The ranch survives today, a small, personal operation that has sold animals to owners in several foreign countries, 80-year-old Lorraine Soltau said. The horses, she said, gave her and Bud a great life, one they shared for 62 years. She will continue to work with them as much as she can. “It’s given us the world, and it’s been an exciting adventure,” she said. Lorraine loved Arabian horses ever since she came upon a carousel in a park when she was four years old. She spent her childhood years on the family ranch at Oroville in Northern California where she passed much of her time riding the family workhorses – a special one named “Buster” was her ride to and from school every day. Later, after Lorraine had put the horses on hold for marriage and family, it was her son Cory who was responsible for getting her back into horses – in particular, Arabians. Cory’s desperate plea for a horse was granted, and at the age of ten, he bred his pony mare to an Arabian stallion, producing a Half-Arabian that Cory enjoyed showing. It was also Cory who introduced the family to the world of endurance, taking riding lessons from the next-door neighbor who was also on the board of directors of the Tevis Cup. Lorraine will be best known in the Arabian horse circles for having bred the stallion Benraz (Ben Rabba x Azramin), the major sire of the Soltau’s program, and also champion show horse. Lorraine heavily promoted the 1971 chestnut, turning him over to Murrel Lacy, who showed him to 1978 Canadian National Champion Sidesaddle and 1981 U.S. National Champion Native Costume, amoung numerous wins in numerous disciplines. But Benraz’s dam Azramin (Alyf x Shlezade) was the real start of the Soltau breeding program. Lorraine purchased the 1949 grey mare from Dr. Howard Kale, after being smitten at the first ride,” and later selected Ben Rabba to breed her, resulting in the great Benraz. Lorraine also loved Arantief (*Aramus x Bint Antifa), a gift from entertainer and Arabian breeder Wayne Newton, and the Australian import Aladdins Comet (Aladdinn I x Torinna), who represented the international aspect of the breeding program. Then there’s Ravven (Ray Dor Echo x WA Celebration), a black stallion the family still has today. “The joy of owning Arabian horses is sharing them with others,” she was often quoted as saying. “My mom also promoted the fact that the Arabian was a versatile horse,” continues Cory. “She felt that the hallmark of the Arabian was that it was a jack of all trades – you could do it all on the same horse, which she did.” The Soltaus bred for and competed in virtually every discipline, including halter, native costume, English, and western. The Soltaus’ horses also excelled in the world of endurance, and Lorraine loved to ride and condition for the Tevis Cup. “She also took pride in the old barn and was there for almost every birth at our farm, going back seven generations. She took foaling seriously and every birth was a source of pride for her, as each one reinforced her breeding decisions,” Cory says. Lorraine leaves behind two sons, Cory and Roy, three grandchildren, and two great-grandchildren. Her husband, Bud, died in 2005 and her son Gary in 1988. As one of the founding members of DAHA, Lee and Bette Vinson wanted to share their love and appreciation for the Arabian horse with other horse enthusiasts. Lee was introduced to the Arabian breed when R.B. Fields asked Lee to train at his Arabian horse ranch in Leavenworth, Washington, in 1951. Then in 1953, John Rogers, of Rogers’ Arabians, Alamo, CA, hired Lee to train there. Rogers’ Arabians owned many horses who influenced the Arabian breed. Serafix* and Natez were the ranches’ two key breeding stallions at that time. In 1958, Lee showed the first U.S. National Champion Mare, Surita, owned by Draper’s Arabians, Richmond, CA. 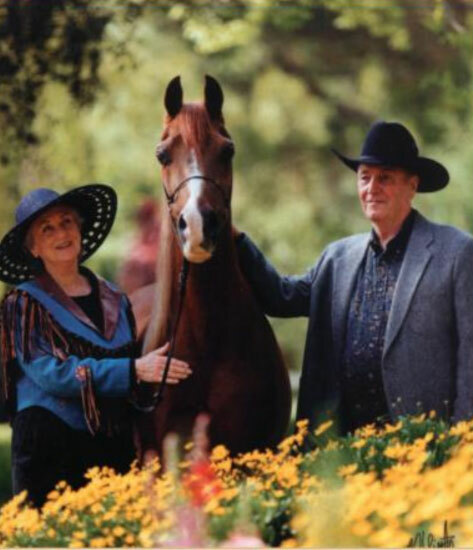 Over the years, Lee and Bette showed both clients’ and their own horses to championships at both local and National shows in halter, English and Western Pleasure, cutting, stock horse, trail classes and N.A.T.R.C. trail rides. It was a considerable shock that we learned of the passing of our friend and long-time D.A.H.A. member, Janice Williams. She had been ill for most of the past year, but it still seemed so sudden and was years too soon. Jan was too young and had many things she wanted to do with her beloved husband , Karl, including travel and enjoying their grandchildren. 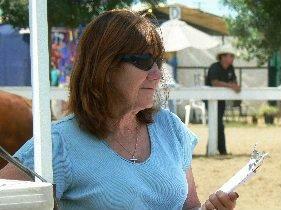 Jan was a bright, enthusiastic, woman of faith, who loved her family and all animals, especially her horses. She had, in the past, managed thoroughbred breeding facilities and eventually became an Arabian horse owner, all while she and Karl raised six children. They lived for many years at their ranch in Livermore, during which time Jan joined and became active in D.A.H.A. 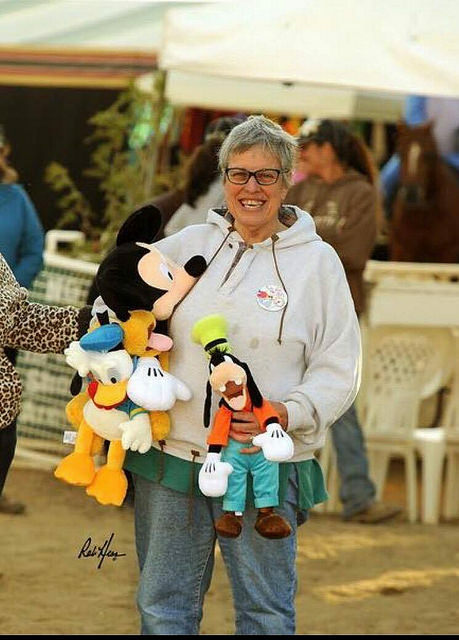 She showed her horses and served on the Board of Directors and on various committees, helping with most of the club’s horse shows as well as other activities.. She was twice chosen to be President, taking her duties seriously and prodding us all to better efforts on behalf of our members and, more importantly, our beautiful horses. Jan was a published author, writing several childrens’ books, as well as Christian romance novels. and to Jan’s mother Olive Braun. We join you in missing her.